Skärgårdshotellet in Nynäshamn - a venue underestimated! Experience the archipelago all the way into your hotel room. Skärgårdshotellet is not the most fancy Place. But it has great charm and our customers come back! We have merged spectacular natural experiences, recreation, inspiring working climates, a light and airy environment and consideration with a value for money concept. Skärgårdshotellet provides you with that homely feel and presents an ultimate experience for those with a predilection for the sea and the archipelago. The hotel boasts 77 bedrooms, all equipped with shower or bath tub, cable TV and telephone, and most of them have wireless internet access. 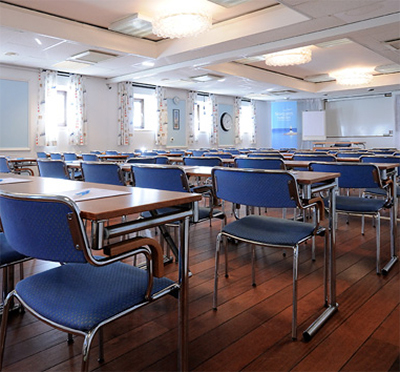 There are also various conference facilities for 2 - 90 delegates along with jacuzzi and sauna. We can offer beer tastings and exhibitions at Nynäshamns Ångsbryggeri (manufacturers of praised beer), fishing safari, creative painting, music quizzes, chocolate tastings, pilates, and jazz evenings. On top of all this, we also serve a delicious buffet à la archipelago flavours which can be enjoyed at the hotel or at sea. We wish you a warm welcome to a pleasant stay here at Skärgårdshotellet. Have you been to Skärgårdshotellet and want to give your own comments?